that statement is true for me in many ways, of course, but never quite so literally as today. today i am not just on the journey of life or faith, but i am much more specifically on a journey towards jerusalem. i will drive to an airport, get on a huge jet and fly to london. there i get on a different plane and we fly to tel aviv. then we get on a bus and ride to the ancient city where we will be staying for the week. it's a far cry from walking or riding a colt, but it's still a pilgrimage, albeit a modern one. i just want to give a shout out to Greg C. who was the only one to give me any musical suggestions for our trip to israel. have a better than awesome friday. check back in tommorow for a post about the beginning of a pilgrimage to jerusalem. that's caedmon's hand. its there from the times that he and jack climb onto the couch (in various stages of undress) and wave goodbye to me when i am leaving for work. its an oily mess, from one perspective. but with the sun shining through it, lighting up my groggy morning, it looked like something altogether different. it looked more like a reminder of what's really important: my family, through which i am beyond blessed. welcome to another random post today. or, as it is more honestly called: the-i-don't-have-time-to-really-think-about-what-i-want-to-write-so-this-is-what-you-get post. -first of all, the big news in our house is that jackson has the croup. (why do we have to say "the" croup? [okay, nevermind, a quick google search showed me that we don't have to say "the" croup. apparently that's just us. weird]). so he's been up quite a bit the last two nights with the coughing and wheezing and whatnot. i've been warning him about his pack-a-day habit, but it's tough. seriously, though, the poor guy has had a couple of rough nights. hard to watch kids being sick. i think he's through the hardest part of it now, though. -one of the best part of january? 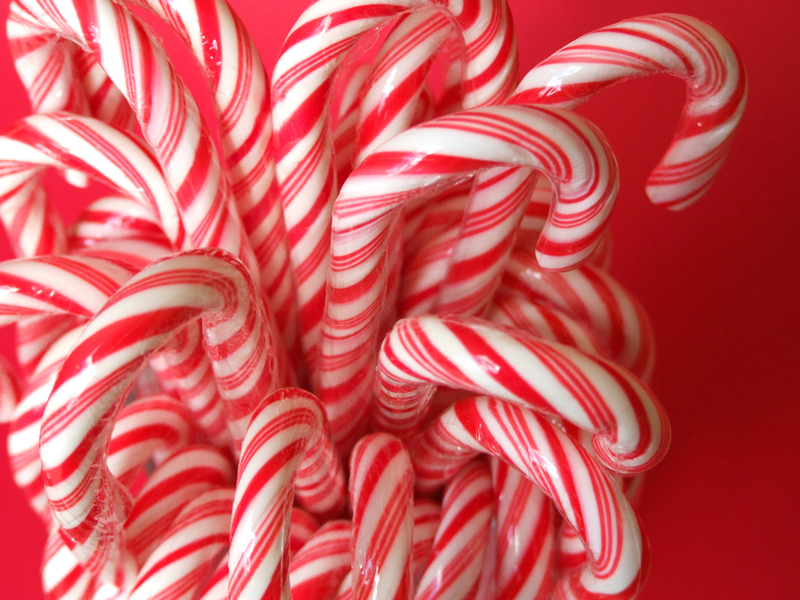 leftover candy canes from christmas. awesome. i have seen all through fatherhood, from even before they were born, that my kids teach me lesson upon lesson about life and love. it's just never been this blatant before. God might as well show up at the door with a singing telegram. it would be no more direct than this. wow. it was 2pm yesterday. naptime. and since i had the day off, i just sat down on the couch and flipped through the channels to see what was on. something on A&E caught my attention, so i watched it for a bit. it turned out to be a show called 'hoarders,' and i couldn't stop watching it. it deals with people who are attached to their possessions and can't let go of them. there seem to be a variety of triggers for this illness, but the results are often similarly tragic: divorce, loss of children, sickness and disease or even death. shannon and i watched three episodes yesterday. anyone else ever seen it? thoughts? in a world as broken as this one, where i notice rubble and detritus all around me all the time, i feel like part of my job as an artist is to make some kind of sense of all the bits and pieces of our lives. i recently sold this collage, and the recipient wanted to understand what all the parts meant. i always find that to be an interesting question. for me, one of the things it means (and this is true of every collage i make) is that i believe in redemption. i believe that even what is broken and torn and rusty and discarded can still be used for something. it ultimately affirms my belief that God not only can still use me, but loves me, despite my brokenness, my tears, and my uselessness at times. for me, art = faith. not in ways that i can mathematically prove or explain, but in ways that resonate in my spirit and call me to keep looking for bits and pieces of broken life all around me, and to keep creating. that's the prayer that just keeps coming out of my mouth these last couple of days. when i watch the news; when i look at pictures like this, and even when i hear people spewing garbage like this, i just am overwhelmed, and can only pray, Lord, have mercy. as i'm leaving to go to a meeting the other night, jackson said to me, "daddy, i love you louder than a giant screams and taller than the tallest building in new york city. always remember that, ok? cause i will always love you. even if you go to heaven before me, still remember how much i love you because i will still love you, ok?" okay, buddy. i won't forget. i might not be able to believe it in about ten years when you're not saying such cuteness. but i'll try not to forget. as for heaven? well, when you say stuff like that to me, i'm pretty much there already. and i want to stand on the empire state building and with my best goliath scream let the whole world know how much i love you, too. remember my old random, stream of conciousness posts? well, here's one for those who enjoyed those. welcome, for a moment, inside the swirling mind of greg. *anybody ever get into the show friday night lights? shannon and i have been working our way through season one on dvd, when we have a chance, and we just finished it and now have started season 2. i love it. i still can't tell if its a guilty pleasure, or if its really a great show. either way, i'm enjoying it. i went to a party on saturday night for the local rescue squad (ems and firefighters), because i had been asked to come and give the invocation by some folks in my church. i went, socialized, had a good meal, and then got a caricature done of me, which is one of those simple little things that i have always wanted to do, but just never had the chance to do it. well, i got to do it, and it was awesome. i am amazed at how people can do that: just look at you and draw an image of you like that. i love this little guy, and am about to set him as my new avatar on facebook. hope you all have a great monday. i was recently commissioned to make a collage for a Christmas gift. the person who commissioned me wanted to give the collage as a friend. the catch was that the friend is a steelers fan. so it needed to be a steelers collage. well, i was excited about this, but i was also a bit perplexed about how to mix my particular style of collage with a collage with such a predetermined subject and palette. so i got some materials and got started. just some art paper, some mod podge and other basic tools. then i gethered together a bunch of steelers papers that i have. now that the nonstop march of Christmas is finally over, i've been spending a good bit of time living to the soundtrack of switchfoot's new album, hello hurricane, so i thought i'd give you a quick little review of it here at agent orange records. it wasn't as easy as you might think to put something together that both stood up and (somewhat) resembled the home of the steelers. you can see below that i tried to emulate the spiral staircases at the scoreboard end of the stadium, the scoreboard itself, and the tiered structure of the building. remember that i am not normally inclined towards these types of things. it was hard enough just finding enough black and yellow and gray peices to make it work! but it was a fun activity for me and the kids. here's our kids and their cousins playing in the snow over christmas break. enjoy! twenty ten. i've been waiting for a while (about ten years, actually) for this moment. now we can all save a syllable everytime we say the year. do you realize that could save us, on average, 13.6 seconds over the course of two thousand t twenty ten? we brought in 2010 by playing chicken feet with dominoes until 1:45 in the morning, complete with lots of laughter and a toast to bring in the new year. today involves a great deal of football and food. and sleeping.